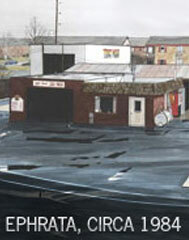 Pays tribute to the history of Cloister Wash & Lube 1984-2012. The wash is now owned and operated by Mister Hotshine Car Wash & Lube Center. Mike Mountz buys Cloister Car Wash in Ephrata, Pennsylvania. Located on 1.6 acres, the wash included a single car wash conveyor, 3 self-serve bays, gasoline sales, and a truck bay. A fourth self-serve bay was added. In the first year a total of 3 employees washed 30,000 cars generating sales of approximately $200,000. At the Ephrata facility off-line interior cleaning was introduced and the existing truck bay was converted to a reconditioning shop at the Ephrata facility. The off-line interior cleaning was the first of its kind in the United States, and was recognized as one of the numerous firsts that Cloister brought to the car wash industry. The facility had a wash capacity of 150 vehicles per hour. As the business began to grow, three additional employees were hired to keep up with the demand for Cloister's services; washing 40,000 cars. A house was razed to make it easier to exit the facility. Employment grew to 12 people washing 60,000 vehicles. Cloister hired its first full-time mechanic and office worker. Employment was 20 people washing 70,000 vehicles. The satellite reconditioning center was closed. Employment grew to 30 people washing 80,000 vehicles. A satellite location was added to do reconditioning for auto dealers and retail customers. Approximately 120 vehicles per week were reconditioned. A pre-existing 1-acre car wash facility was bought in York, Pennsylvania. The facility was razed and new construction began. The York facility opens for business. The facility has a production capacity of 175 vehicles per hour. Cloister’s first "Customerland" is opened which features refreshments, car memorabilia, and a gift shop. A Cloister Lube Shop, a 3-bay operation, is added to the car wash at the Ephrata facility. Employment grows to 40 people washing 80,000 vehicles. The Lube shop services 8,000 vehicles and begins recycling motor oil to heat the facility. A 3.5-acre tract of land was bought from Kerek Freight Shipping Company in Lancaster, Pennsylvania. The buildings were razed and new construction began. Employment reaches 45 people, with washes holding steady at 80,000 vehicles. Vehicles serviced in the lube shop grow to 10,000. Gas sales are stopped and the fuel tanks are removed in Ephrata. A 40,000 square feet under roof facility opens in Lancaster including a 4-bay lube shop. The facility features two wash tunnels with a dual capacity of 400 vehicles per hour. A unique feature of the site is conveyor belts that move the vehicles through the interior cleaning and reconditioning building. This speeds production and reduces worker fatigue. The innovation will be adopted by other washes around the world. With the addition of Lancaster, employment grows to 100 people washing 200,000 vehicles. The number of oil changes reaches 25,000. Cloister employment has now reached 130 people. Annual wash volume is 280,000 vehicles, and annual oil change volume reaches 30,000 vehicles. State Inspection Service is started. A corporate office is opened at the Ephrata site. Cloister wins the International Car Wash Association's Leadership in Innovation Award, and York County's Beautification Award. A new conveyor and other tunnel enhancements are installed at the Ephrata wash enabling vehicles up to 84" to be washed. Employment is now 150 people. Wash volume grows to 300,000 vehicles, with 40,000 vehicles being serviced in the lube shop. Cloister launched the Grace For Vets program, offering a free wash for veterans and current service personnel on Veterans Day. Grace For Vets eventually becomes a worldwide industry program with over 3,000 participating locations. A 7.2-acre tract of land is purchased in Reading, Pennsylvania and new construction begins. Cloister now employs 275 people washing 450,000 vehicles per year and servicing 50,000 vehicles per year in the lube shop. The Ephrata location is significantly expanded by purchasing and razing adjacent properties. Cloister is awarded the International Car Wash Association's Community Service Leadership Award. The The 44,000 square feet under roof Reading facility opens for business with a car wash, 4- bay lube shop, and pet wash. It has a single conveyor production capacity of 220 vehicles per hour. Employment is now 275 people washing 600,000 vehicles and servicing 60,000 vehicles in the lube shops. Cloister continues its rapid growth. 400 people are now employed. Wash volume reaches 700,000 vehicles. Lube shop services grow to 70,000 vehicles per year. The Reading facility opens the world’s first lifted, dedicated, self-service motorcycle wash.
Cloister and its Founder, Mike Mountz, are inducted into the International Car Wash Hall of Fame. This is the ICA's highest achievement award. Wash volume passes 750,000 vehicles per year at the 4 Cloister locations. Lube shop services top 80,000 vehicles. Cloister Wash & Lube is sold to Mister Hotshine Car Wash & Lube Center and now operates under that name. At the time of sale, Cloister's employment had reached approximately 400 people. Annual volumes were 800,000 vehicles in the washes, and 85,000 vehicles in the lube shops. Combined annual sales in Ephrata, York, Lancaster, and Reading were $14 million. Thanks for the memories. It was a wonderful 28-year journey. The journey would not have been as successful and as much fun without God, great employees, and our collective belief in what Cloister could be. Thanks to my loving wife Rhoda and our children Elton, Tonya and Weston for their sacrifice, patience, and understanding. A special thanks to Del Burkholder for 28 years of loyalty, hard work, and dedication. A special thanks to the many employees with extended service. And finally, thank you to every employee who worked at Cloister over the years. Your commitment to the Team Cloister vision made all the difference.